The major weather centres (UK, USA, ECMWF) use ensembles to help them to quantify the inherent uncertainties in Numerical Weather Prediction (NWP. )This page sets to help sailors benefit from that information. In recent years, we sailors have seen a bewildering increase in weather information made available due to the wonders of the internet. We can see synoptic scale charts of isobars straight off the computers, sometimes modified by human beings. We can see an enormous amount of information in digital form. While the quality of the predictions has been increasing slowly, the quantity of data is continuing to increase. Is the volume of data outstripping the information content? Specifically, is there value in having forecasts from more than one computer model? We can now get global computer model output from several sources. 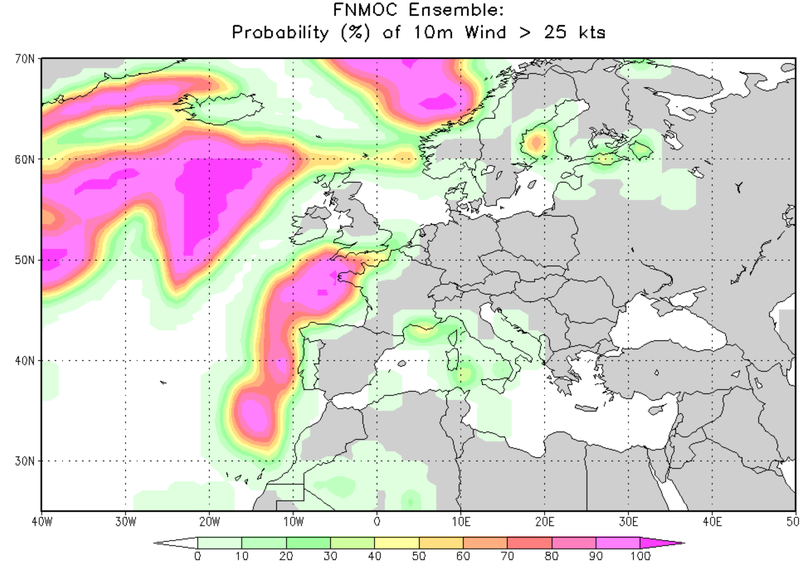 One way of seeing the effects of running model ensemble is to visit the Meteociel.fr site. They have a number of displays from, among others, the US GFS and ECMWF ensembles. Ensemble of 20 72-hour forecasts. The bottom right is the deterministic forecast. GFS ensemble wind speeds for a point in the North Sea. Speeds are in km/hr. Roughly, 2 km/hr=1 knot. The GFS deterministic forecasts are in the far-right hand column, the other columns show the 20 ensemble forecasts. At 24 hours, wind speeds in the ensemble vary from 11 to 40 km/hr, F2/3 to F5/6; the GFS forecast was F5/6. The 48 hour forecast is from 33 to 51 km/hr, mid-F5 to F7; the GFS said F6. Watching a series of these ensemble results shows, first, that there is no such animal as a precise or accurate forecast. 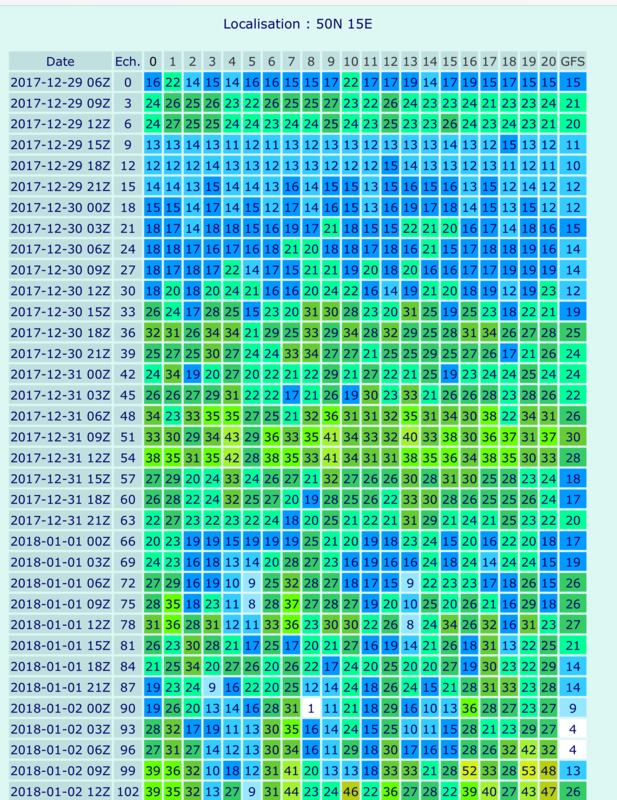 Secondly, it shows that on some occasions, even 24 hours ahead there can be marked differences between ensemble members whilst on other occasions, differences are small even 7 days ahead. Ensembles do not provide alternative forecasts for the users to pick and choose which one they like best. They are simply an indication of confidence in a forecast. By the same token, the same is so for NWP output from different models. They are, in effect, a small ensemble. The table of ensemble members makes it quite clear that from four ensemble members, three might look similar but the odd man out could be the best. There is no way of knowing. The same will hold trues for four global models all using the same basic observational data. A more useful, practical indicator of reliability is to compare successive forecasts 24 hours apart, 12 at most, from the same source and look for consistency. A more useful presentation to help sailing decisions is to use the US Navy FNMOC 20-member ensemble. This provides probabilities of winds exceeding certain thresholds for various regions. You will have to accept conditions here because it is a US military site. No problems, hit Advanced. Areas for which forecast probabilities can be obtained from the US GFS. For each area they provide displays like this. Probabilities of winds >25 knots; other thresholds can be used..
An alternative display is available from the US NOAA Ocean Prediction Center. 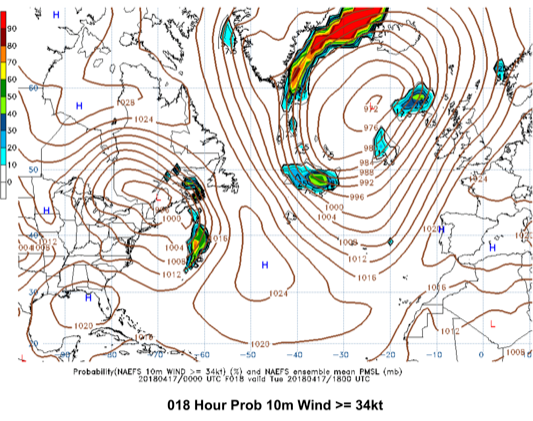 This superimposes probability data on a chart of isobars over, in this case, the North Atlantic. This may not be as easy to use but gives a good overall view showing how the strong winds relate to the synoptic pattern. .
Probability of winds exceeding 34 knots over the North Atlantic. With global model forecasts becoming available from more sources, inevitably the question arises about which to use. However, there is much interchange of information between modelling groups through WMO. Consequently, differences between models over the first few days are more like an ensemble rather than superiority of one model vis a vis the rest. This is shown in the next diagram from http://www.weathercast.co.uk/. Comparison between deterministic forecasts of wind speed from NCEP (GFS), ECMWF and an average of three models including the CMC. The pale grey lines are the GFS ensemble. For the first few days there was little to choose between the GFS and ECMWF. 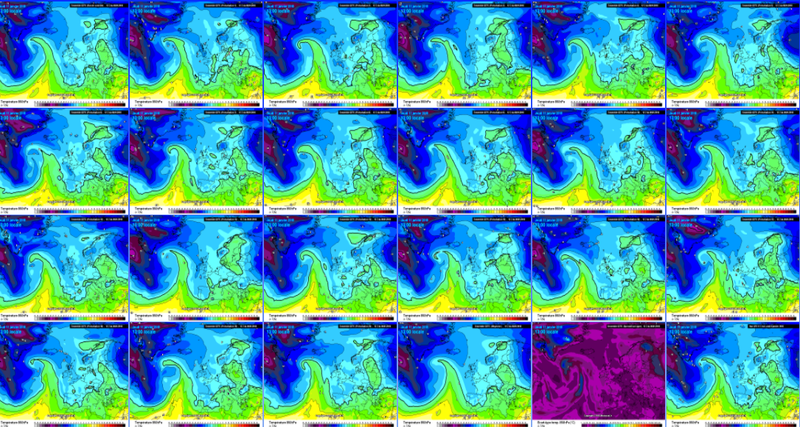 Through the first 10 days the ECMWF was within the ensemble range of the GFS.